Abbotsford British Columbia, home of the Abbotsford International Airshow, hosted the 41st edition of the big show ..Celebrating the 100th Anniversary of Powered Flight, gates were open to the general public at 8:00 am. The huge static ramp welcomed visitors at 8:30, with light flying events at 10:30, and the main air program at 11:30. Opening Ceremonies followed at noon or thereabouts. The days events ended at 5 pm. and gates were closed to patrons at 6 pm. Ten hours - enough for anyone's venue in one day, even the most avid of airshow fans and aviation enthusiasts. Regardless of being somewhat of a weather challenged show this year - some cooker heat, clear blue high sky, clouds, showers, humidity, haze and peek-a-boo sun stuff - the gate numbers were reported to be better than expected, apparently exceeding last years 3 day total of 160,000 by an estimated 20 percent. An encouraging continued increase since the lost year of 1998. Although the days of old may yet be a ways off, the come-back trail appears pretty darn positive nonetheless. Abbotsford is less than an hour's drive east of Vancouver, BC on the main Trans Canada Highway. It is in the heart of the fertile Fraser Valley and a major agricultural centre. The airport has undergone phenomenal growth in traffic and has earned international status. Ground displays & attractions were plentiful as were vendors of all sorts. This year though held a new look and variety of food and drink concessions, monitored by a ticket purchase system rather than by payment of cash at each stand. Change is good, some say. Well rounded and entertaining announcers make for essential ingredients of a smooth and successful airshow program. The Abbotsford Airshow is indeed fortunate to have two of the best in the business. Bob Singleton, veteran airshow narrator and his fun loving side-kick Roy Hafeli, an accomplished air display and special events announcer in his own right, both local guys, did a fabulous job of keeping the show on track, despite fluctuating weather conditions and inherent flying schedule adjustments. Always the consummate professionals, even when reminding those who should, by common sense, know better than to light up cigarettes on dry grass areas, let alone around fuel venting aircraft. 19 Wing Comox, B.C. and 4 Wing Cold Lake, AB were likewise well represented with both ramp display aircraft and 'Hot Line' performers. A CT-156 Harvard II, based at Moose Jaw SK made it's inaugural visit to Abbotsford, giving the aviation minded a first-hand look at the Canadian/Nato version of the United States T-6A, "Texan 2" produced by Raytheon Aircraft Co., an example of which was on show display last year. The United States Navy "Blue Angels" and Canadian Forces "Snowbirds" jet formation and aerobatic teams were this year's premier performers. The "Blue Angels", formed in mid 1946 and the "Snowbirds" first performing in 1971, although equally impressive in their respective air display regimens, are completely different in every other aspect. Perhaps this is why the American and Canadian teams are such an interesting and entertaining contrast, which also serves to compliment one another and their distinct styles of aerobatic routines, brought about mainly because of the types of aircraft they fly. The "Blues" six plane unit use, with great ability, the fast, powerful and thunderous F/A-18 Hornet fighter, primarily in variables of four formation aircraft and two solos. The single seat Hornet version is a 56,000 lb max. weight takeoff, 1.7 mach airplane, powered by two General Electric F404-GE-400 turbofan engines, each capable of pushing out 16,000 lbs of thrust. The nine-plane "Snowbirds" team on the other hand, fly the venerable 2 seat, 7,170 lb (approx. ), 412 knot airspeed, CT-114 Tutor pilot trainer, powered by a single General Electric J-85 Can 40 engine producing just 2,700 lbs of thrust. The dexterous aerial ballet style "Snowbirds", for the most part operate in the nine, seven and five plane variables, with breakaway doubles and solos. This year the "Blue Angels", which can transition the Hornet to active duty within hours of deployment, are scheduled to perform nearly 70 air shows at 34 locations in the United States and Canada. The Canadian Forces "Snowbirds" 431 Air Demonstration Squadron performed a special Centennial of Flight show at Abbotsford, as part of the '100 Towns for 100 Years national tour', in celebration of the 100th Anniversary of Powered Flight. Moreover, the "Snowbirds" in their 33rd season will perform 65 shows at 41 locations across North America. Other flying acts included: The Canadian Museum of Flight at Langley, B.C. and some of their pristine aircraft consisting of biplanes, an SE-5 replica, a Fleet Finch, a de Havilland DH 82 Tiger Moth, a Waco F series, an award winner Cabin Waco, AQC6, plus a low wing Mk IV Harvard, in singles and formation fly pasts, Horizon Aero-Sports Parachute Demo, 19 Wing Comox CH-149 "Cormorant" Transport and Rescue Demo (now 5 examples on active duty at Station Comox), Bud and Ross Granley displaying their pilot skills and showmanship in the Fouga V tail Trainer, "Golden Hawk" Harvard (SNJ actually), and the Yaks, 18T and 55M. The effervescent and much accomplished Julie Clark was back and performed the ever graceful musically choreographed aerial ballet in her Mopar Parts sponsored Beech T-34. Kent Pietsch and his extraordinary comedic flying and dead stick routines in his Interstate Cadet caused plenty of aahs and laughter from onlookers. Eddie Andreini, a 35 year airshow veteran flew solo routines in his 450 hp 'Super Stearman' and an all-red Russian Yak-9U called "Barbarossa". "The King of Sailplane Aerobatics" Manfred Radius again beautifully presented his Salto H 101 silent aerobatics - the man is a master. Although there were no commercial airliner or military jet fly-byes, at least on Friday or Saturday, Hellijet Airways put on an impressive exhibition of their Sikorsky 76 Spirit Helicopter. Several 'Warbirds' also went airborne bringing back to us all a piece of history with their solo and formation fly pasts. The "Heritage Flights" were back. Major General William Anders (retired) flying "Val-Halla", a P-51D Mustang in element formation with an F-15C Eagle of the United States Air Force piloted by Captain Lendy Renegar. The Canada Heritage Flight comprised a Mk IV Harvard, from the Museum of Flight at Langley B.C. flown by George Kirby son, and a CF-18 Hornet with Captain Travis Brassington at the controls. 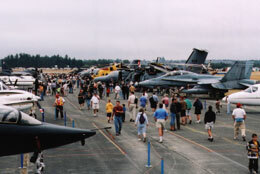 Military Tactical and Multi-Role Fighter Demonstrations were provided by a U.S. Navy F-14 "Tomcat", a U.S.A.F. F15 "Eagle" and a Canadian Forces CF-18 "Hornet". Regardless of the day and weather these guys really rattled God's rafters and the crowds loved it. The "Tomcat" handled by Lieutenants Andy "Stik" Mrstik, pilot, and Courtney "Disco" Kinnan, Rio, both of Naval Air Station Oceana, Virginia, let it all go with this Mach 2 + Carrier-based multi-role strike fighter, the longest service time fighter in the U.S. Navy. Not to be outdone, Capt. Lendy "Alamo" Renegar, a West Coast Demo Team Pilot, likewise well demonstrated the capabilities of his mount, an F-15 Eagle, but he too, within certain boundaries of course, lest there be square eggs, curdled milk and frayed nerves for a few days, plus a few other things thrown in for good measure no doubt. A 'Tiger in the Sky' was the 'Canuck' contribution and contribute he did. Captain Travis "Brass" Brassington of 410 Tactical (Operational Training) Squadron, Cold Lake, Alberta, driving the CF-18 Hornet dressed in a tiger motif paint scheme, in recognition of the 'Tiger Meet of the Americas' to be hosted at 4 Wing Cold Lake this September, put on a super display of colorful flying both as a solo act and the 'Heritage Flight'. Overall, a heck of a show and the continuing addition of piston engine war birds is a most welcome change of pace and time.